Click 'Edit' in the top toolbar and select 'Text' item. Choose a fragment of text you want to edit. Make changes and click on the blank space. Click ‘Edit’ and select the ‘Image’ item. Click on the page and choose an image from Finder. Move and/or resize the image. As you can see, editing content in a PDF on Mac is a piece of cake with PDF Expert. With just a few clicks, you can edit text inside a PDF with ease. Let’s explore the nitty-gritty details and learn some essential tricks about how to edit PDFs faster, better and more easily on macOS. 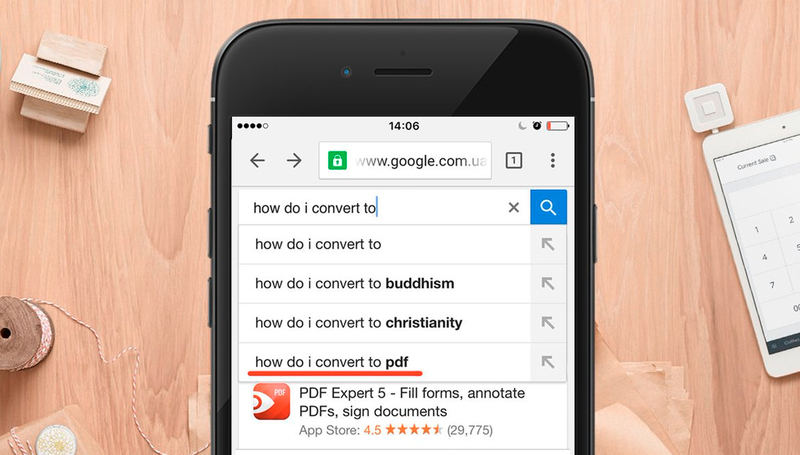 The PDF format can be easily perceived as the fourth largest religion. This explains why so many people want to know how to convert to PDF on a Mac. PDF was initially designed as a reliable, non-editable variety of digital paper. However, there are many cases today where you need to make changes in PDFs. It could be something as simple as fixing a typo or adding a couple of zeros to an invoice, or something slightly more complex like adding more content by merging two or more PDF files or creating a Table of Contents in a PDF File. Whatever the reason, you need a PDF app for Mac that offers the best way to edit a PDF file on Mac. 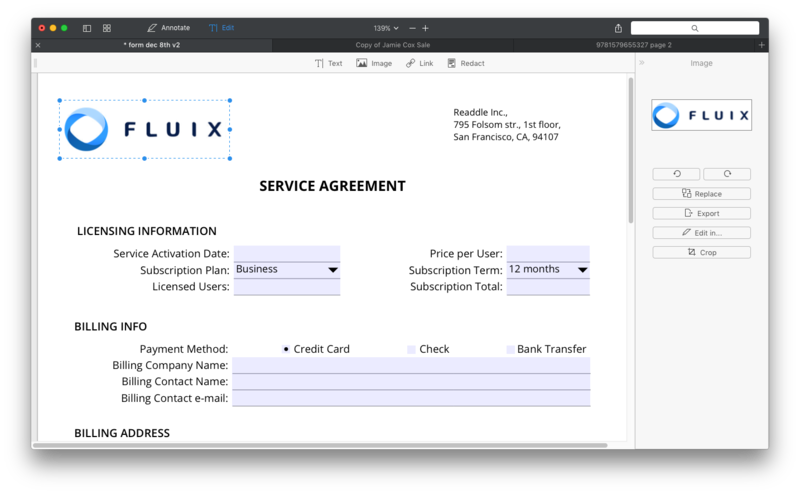 That’s why we created PDF Expert, a beautiful and powerful PDF Editor for Mac. You should download a free trial and discover its incredible set of features along with us! 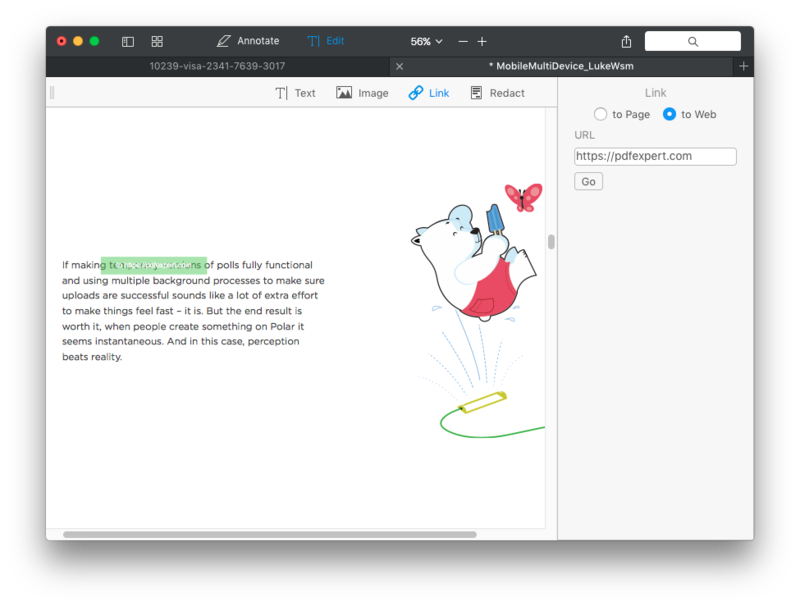 Edit PDF content - add shapes, signatures, stamps, annotate or edit existing text, images and links. 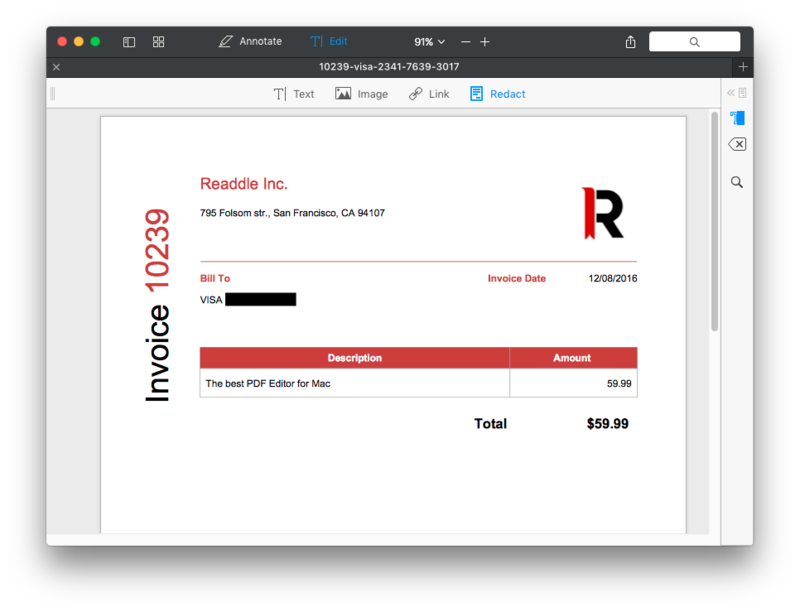 The ability to edit a PDF is vital for people who constantly work with contracts, agreements, and other documents (simple invoice template for example). How many times have you discovered that something is wrong or entirely missing in the contract document, five minutes before your boss demands to see it? Or how about that quick scramble to update your CV with relevant information right before an important interview during your college campus placements? You never know when you might need to edit and update a PDF file these days. There are a wide variety of editing tools available in the market today; some of them work better and some worse. Our main goal is to show you all of them allowing you to decide for yourself how to edit a PDF on Mac faster. 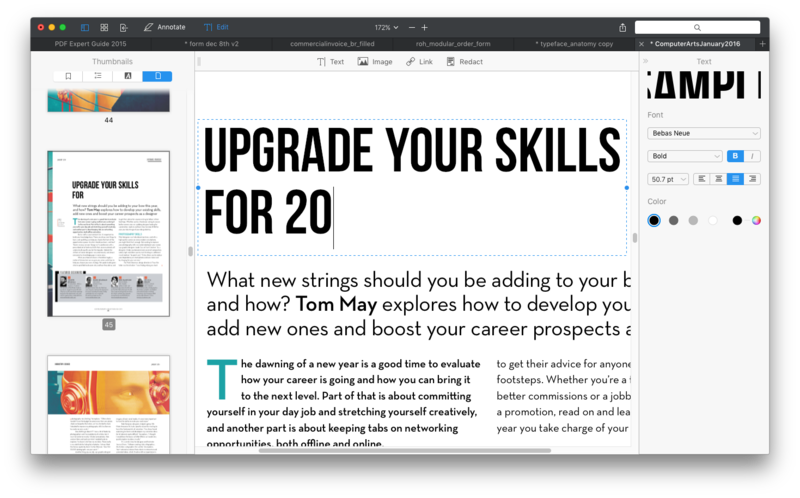 PDF Expert is designed to be an easy-to-use, yet powerful PDF editor for Mac. The interface is super clean and intuitive, much like its iOS version. PDFs are opened without delay, irrespective of whether they are small email attachments or 2000-page image-flooded reports. Get your free trial now and let's start! 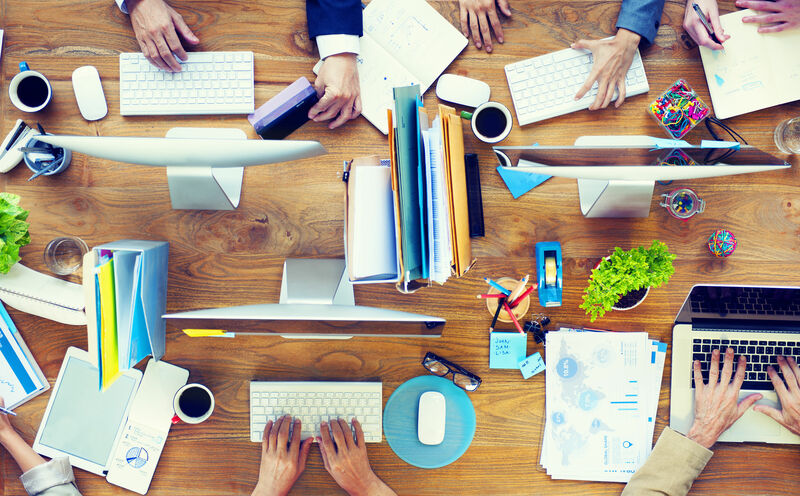 A single click opens a set of tools to edit your content. What are these tools? How to edit text in PDF on Mac? Do you want to make changes in a contract or fix a typo in your name or street address? Literally anything can be accomplished by PDF Expert. Open the editing mode by clicking in the top toolbar. Click on the 'Text' button. Choose the piece of text you want to edit. Edit text in PDF and click on the blank space to preserve your changes. Do you want to change your company’s logo or insert a new graph in a business document? PDF Expert gives you enough capabilities to do magic tricks with your images. Click on the 'Image' button. Click on the image to move, edit, rotate or delete. Click on the ‘Image’ button. Click anywhere in the document and choose the image you want to add. How to add hyperlink to PDF? Do you want to link any part of the text to a different page or a website? It’s easy! Moreover, links can even be added to your images (yay!). Click on the 'Link' button. Select the piece of text you want to link. Choose the link destination: 'to Page' or 'to Web'. Easy peasy! How to redact a PDF? Do you want to permanently delete or white out sensitive text and hidden data in your PDF? PDF Expert has the best PDF redaction tool! We found it to be extremely useful for legal contracts. Select the fragment of text you want to redact in PDF. Search for the specific words you want to redact in Find menu. Type the word you want to hide across all the document in the 'Find and Redact' field. Click on the 'Redact' button. PDF Expert provides the best experience for create outlines to ease your navigation through whole files (especially if it's a large one). Click on 'Edit' > 'Add Outline item' or simply click ⌘⇧D. Right click on the Outline item at the sidebar and choose 'Delete', 'Rename' or 'Change Destination'. To add a new item, proceed 'Edit' > 'Add Outline item' or click ⌘⇧D again. How to merge PDF Files on Mac? Do you want to merge PDFs into one file on Mac? It has never been so easy. If you want to mess with your colleagues’ documents by mixing pages up and putting them all-into-one, this tool is definitely for you! As you see, you can edit almost everything you want with PDF Expert. You don’t have to waste time when it comes to removing a word or replacing an image in your PDF. All you need to do is to make the right choice. We’ve already done everything by making PDF Expert a perfect solution for your PDF related tasks. Get your free trial or Buy PDF Expert right now!